Not to be confused with Invincible Mario. Rainbow Mario is a special form of Mario that appears in Super Mario Galaxy and Super Mario Galaxy 2. Mario can reach this form by obtaining a Rainbow Star. It makes Mario invincible, much like the Super Star, but the effects of the Rainbow Star are more extensive and longer-lasting than those of a Super Star, and Mario can break through certain objects. However, he cannot earn extra lives by defeating enemies, nor can he combine this power-up with any other power-up; if Mario touches one while invincible, the other item will be kicked off-screen. 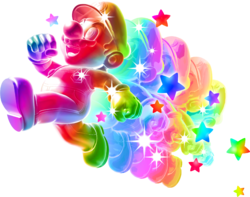 As Rainbow Mario runs, he changes colors (but in Super Mario Galaxy 2, Mario and Luigi just turn red), and leaves a rainbow-colored afterimage trail behind him. The music as well as Mario himself will increase in speed while in use, making Mario harder to control until it runs out. Wii Super Mario Galaxy 2 What would you get if you combined Mario with a bouncing, rainbow-colored star? An amazing, invincible Rainbow Mario, of course! Plus, Mario will glow with twinkling stars and have an energetic song play for the duration. Doesn't that make you want to run out and grab a Rainbow Star right now? What would you do if you found a star that glowed in seven colours? "Grab it quick"? Well, that would be the smart thing to do, because it'd probably be a Rainbow Star! It turns everyone's favourite moustachioed man into a...well, a rainbow-coloured mouastachioed man. Not only does he become invincible, but he looks fab! Rainbow Mario pursuing a Golden Chomp in Gusty Garden Galaxy. Rainbow Mario about to defeat several Octoguys in Deep Dark Galaxy. Mario obtaining the Rainbow Star for the first time in Sky Station Galaxy. Rainbow Mario about to defeat several Spinys in Yoshi Star Galaxy. Rainbow Mario's theme is a re-orchestration of the classic invincibility theme, with the same melody heard from Super Mario World 2: Yoshi's Island and Super Mario 64. The artwork for Rainbow Mario is similar to Invincible Mario's artwork; Mario's poses in both artworks are identical, though he faces a different direction in each artwork. This page was last edited on April 17, 2019, at 11:45.